Groupe Aeroplan Adopts New Name and Global Brand Identity - Aimia Inc.
MONTREAL, QC, Oct. 5, 2011 /CNW/ – Groupe Aeroplan Inc. (TSX: AER), a global leader in loyalty management, today launched its new name and global brand identity. Effective immediately, Groupe Aeroplan will carry on business as Aimia. While the names and brand identities of consumer facing brands Aeroplan, Nectar (Chile, Italy and the UK) and Air Miles Middle East will remain unchanged, business-to-business brands LMG Insight & Communication and Carlson Marketing will now operate under the name Aimia. Aimia deploys its full suite of services across all vertical industries, geographies and channels. Aimia can service any client constituency in the business-to-consumer, business-to-business and business-to-employee space. Aimia’s global services offering fully leverages the capabilities acquired over recent years. The Groupe Aeroplan identity, which was derived from the name of the original frequent flyer business and remains closely connected with the Aeroplan program in Canada, was no longer an accurate reflection of the company, its employees, global footprint and unique full suite of loyalty management services. For more information about Aimia’s global research on next generation consumers, please consult the company’s news release entitled How Generation Y will reshape customer loyalty. Effective October 7, 2011, the company’s ticker symbols on the Toronto Stock Exchange will be changed and its common shares and cumulative rate reset preferred shares, Series 1 will begin trading under the symbols AIM and AIM.PR.A, respectively. The proxy circular for the next Annual Meeting of Shareholders will include a proposal to amend the company’s articles of incorporation to change its corporate name to Aimia Inc.
Groupe Aeroplan Inc., doing business as Aimia, is a global leader in loyalty management. 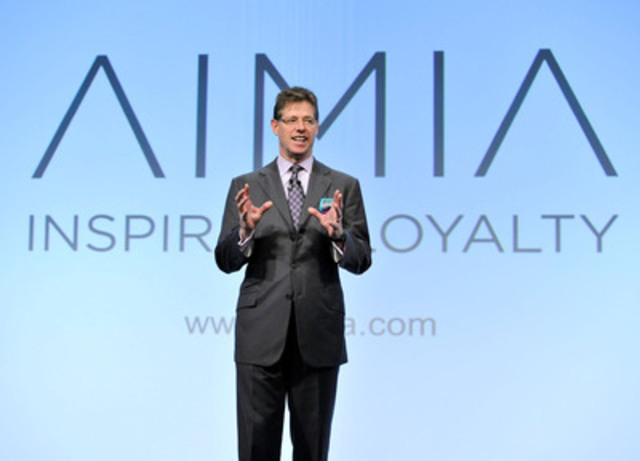 Aimia’s unique capabilities include proven expertise in delivering proprietary loyalty services, launching and managing coalition loyalty programs, creating value through loyalty analytics and driving innovation in the emerging digital and mobile spaces. Aimia owns and operates Aeroplan, Canada’s premier coalition loyalty program and Nectar, the United Kingdom’s largest coalition loyalty program. In addition, Aimia has majority equity positions in Air Miles Middle East and Nectar Italia as well as a minority position in Club Premier, Mexico’s leading coalition loyalty program. Aimia is a Canadian public company listed on the Toronto Stock Exchange (TSX: AER (currently) and changing to TSX:AIM effective October 7, 2011) and has over 3,800 employees in more than 20 countries around the world. For more information about Aimia, please visit www.aimia.com. Note to Editors: Aimia will also hold a virtual event today to unveil its new name and global brand identity. For access to the event site, please contact media contacts listed below.